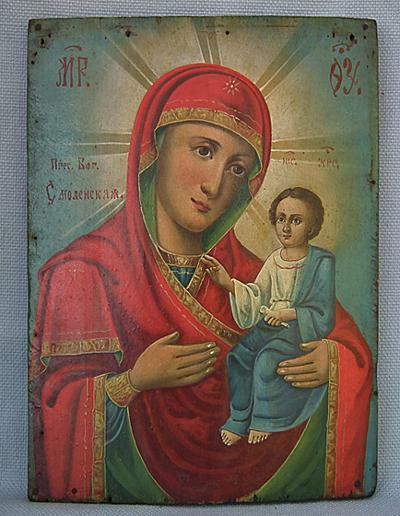 , 19th century, finely hand painted on a wooden panel, Russian Orthodox Icon, The Mother of God of Smolensk "Smolenskaya" (Hodigitria or Patron of the wayfarers). 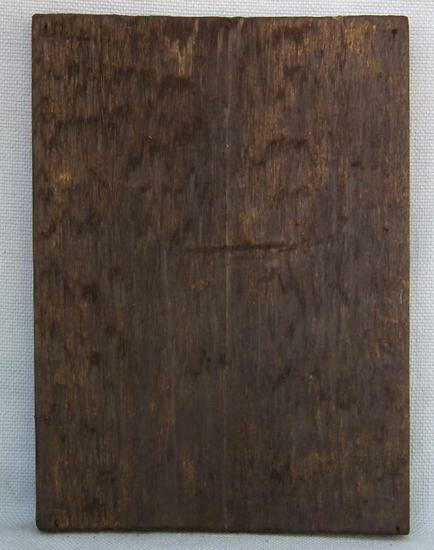 MEASUREMENTS: 29 cm x 21 cm ( 11 3/8 in x 8 1/4 in). CONDITION: The icon is in the original good condition with a nice old patina. The border with remains of the iron nails. No repairs or restorations. In the eleventh century a copy, made in Constantinople, of the Hodegetria Virgin came to the Slavs in the retinue of the Byzantine imperial Princess Anna, who married Prince Vsevelod of Chernigov in 1046. In 1101 it was installed in the Cathedral of Smolensk by Prince Vladimir Monomakh. The icon was brought to Moscow in 1308 and returned to Smolensk again in 1456. Many miracles are attributed to the work of the icon, among them the defeat of Napoleon at Borodino, after it was paraded before the Russian Army in 1812.